A healthy and delicious breakfast that’s ready in almost no time and can be prepped ahead? Meet your new bff… Petite Vegetable Frittatas! Press play to see how easy these are! Back in the day I wasn’t really a breakfast person. Well, unless it came in the form of a jumbo double chocolate chip muffin from Costco!! Do you guys remember those? They still exist and it’s basically just chocolate cake in muffin form. They were best when heated up for 25 seconds so the chocolate chips just barely start to melt. Oh man, I can literally taste them just writing this. I’m just going to forget about the fact that they were about 2 billion calories each. Times have since changed and now I’m all about a healthy breakfast to kick off the day like these Petite Vegetable Frittatas! Thomas and I go through these like whoa! I make them every few days and we just re-heat them every morning in a toaster oven. 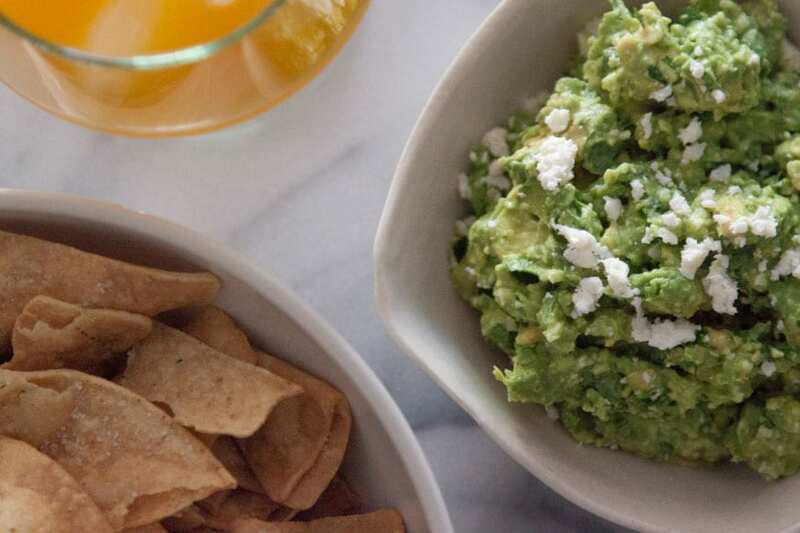 I’ve been known to dunk them in salsa, add a dollop of guacamole, or go back to my childhood ways and add a squirt of ketchup! They’re perfect because the last thing I want to do in the morning is make a mess of my clean kitchen! You can make them with any vegetables you have laying around your kitchen, add a touch of cheese and some fresh herbs and you have yourself a perfect breakfast! Preheat oven to 350 degrees. In a large 10 inch skillet heat the olive oil over medium high heat. Sauté the diced zucchini, onion and red and yellow bell peppers for about 5 minutes until they are slightly soft. Season with salt and pepper. Add the sautéed vegetables to the bottom of a regular sized muffin pan. In another bowl, whisk together 8 eggs and season with salt and pepper and add the chopped chives and parmesan. 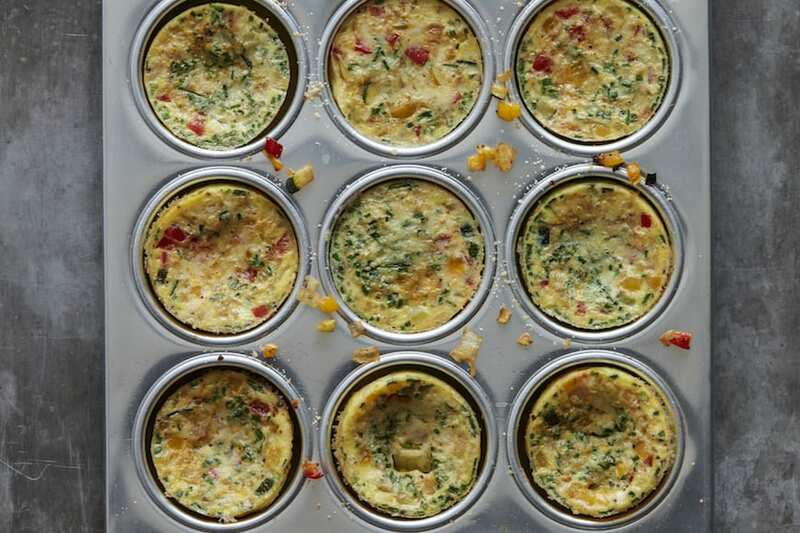 Fill the remaining area in the muffin tin with the egg, gently stirring the ingredients together. Bake in the oven for 10-12 minutes until the eggs are completely set. My first frittata! It’s so good! Thank you for sharing. 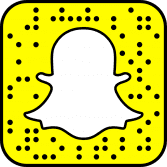 Pingback: 9 ways to make your breakfasts way, way better - Snap Tips! Pingback: 9 ways to make your breakfasts way, way better - How to do everything! My first frittata I’m in awe!! Oh my goodness, these sound so yummy! These would be perfect for on the run breakfast for the kids as well as perfect for a brunch! Love how you added all those lovely veggies from your fridge! Need some of these to help me along with that healthy New Years Resolution! These are the perfect breakfast bites!! Thank you ,thank you! I have been wanting to make something like this. Making these tonight to have for breakfast all week; thanks for the idea! 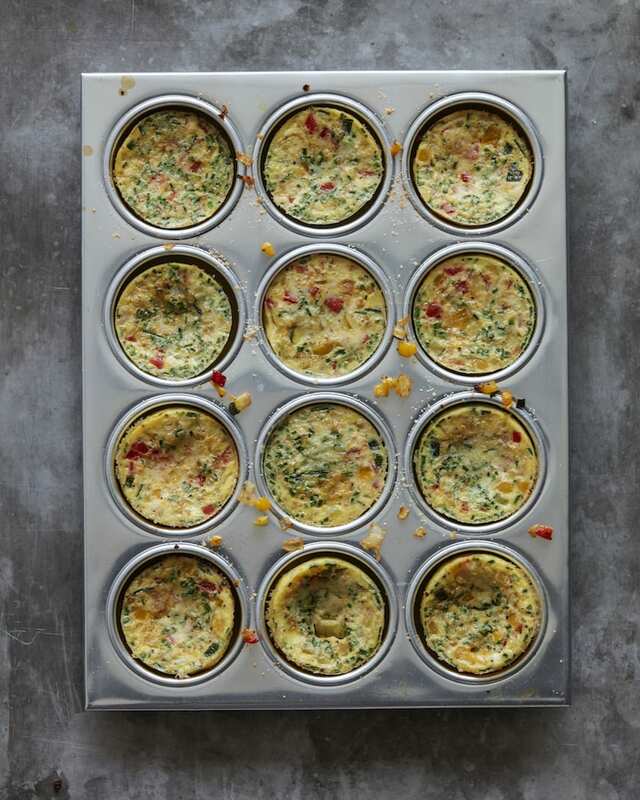 I read about some egg muffins similar to these fritattas the other day. I would be curious to know if tomatoes would be an acceptable ingredient? Thank you! I think the tomatoes might give off too much water! How do you prevent them from sticking to the cupcake tin? 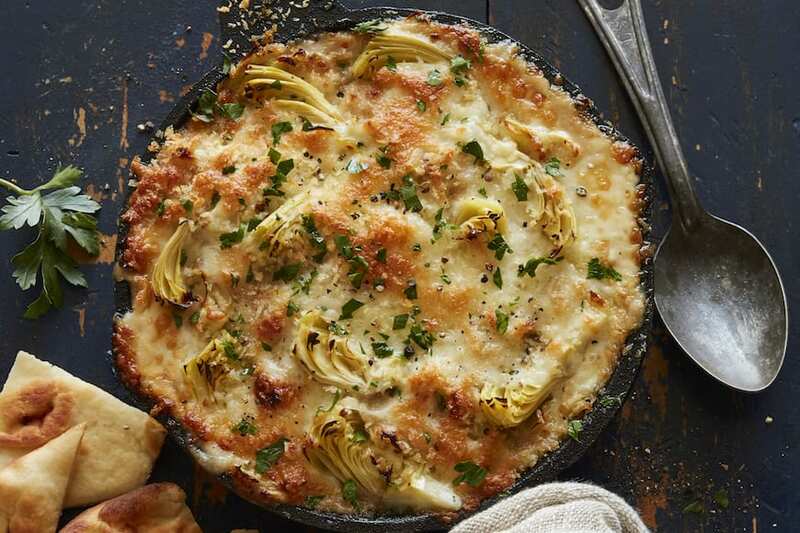 it’s a nonstick pan – but you could use a little non-stick spray! Mine were pretty stuck to my non-stick muffin pan. Next time I might grease with butter or use muffin liners next time! I use alum muffin cups. Makes clean up so much easier. I tried the spray and I still had a mess to clean up. Frittatas for life! Looks and sounds soo good! I made these using 5 eggs and 4 additional egg whites. I used a non-stick pan and sprayed it. I had trouble getting them out of the pan. I am wondering if you have any thoughts about getting them out of the muffin pan. I also tried using muffin liners, this was not successful. I love the recipe and want to continue making them! Hey Jane! I make them on a weekly basis with a non-stick pan and spray and I just take them out of then pan as soon as they come out of the oven. I don’t let them cool IN the pan as that sometimes makes it harder to come out! I made these for easter brunch and they were a huge hit!!! I’m making more right now. Thanks for the yummy recipe!! How do you store these post baking/pre reheating? let cool to room temp, then keep in an airtight container in the fridge. Then pop them in a microwave or toaster oven to re-heat before eating! These are great and easy to make to have breakfast ready for the week, I enjoy mine with hot sauce and avocado slices! Love, Love, Love these!!! I will be prepping on Sunday also!!! So easy and perfect meal prep for breakfast! Love it! I love the mini size of these! How well do they freeze? Can these be served at room temp? I love this! Hardly comment on any post. Just that this I really need to credit! How long are they good in the fridge? Is freezing an option? Outstanding. Love the small, on-the-go bites. I mixed 1 less pepper but added chopped spinach. They’re good with a slice of tomato which I assume one could add to recipe. Thanks! Okay, but you don’t need to bother with the muffin pan. Just double the recipe and bake at 425 degrees for 20-25 minutes in a 9×12 or similar baking dish. I use Pyrex and oil it first. When done, cut into squares like you would brownies. Then freeze or refrigerate and use just as you would the muffin-style ones. Less cleanup. More frittata. As for the veggies, I tend to sauté first. Then I can use tomatoes, mushrooms or other “wet” veggies. After sautéing, I usually wind up with about 4 cubes of cooked veggies to 10 eggs and two cups of shredded cheese. without dairy is totally cool! These are truly awesome little bites and so convenient to have for breakfast ahead!